My theme for the A to Z Blogging Challenge this year is a mishmash of books, movies, writers and TV shows that have in one way or another taught me something about writing and helped me be a better writer. Some inspired my own stories and a few taught me what not to do. Each post is a one minute lesson on writing. I'm also participating in the challenge with the other co-hosts over at the IWSG blog where I have some everyday inspiration to talk about. I was in the fifth grade when I found a battered copy of A Wrinkle in Time by Madeline L'Engle on the shelves where my teacher set out her own books for us to borrow. This book was the first speculative fiction book that I read. Nobody called characters geeks during those days but that's exactly what Meg and Charles were. And I loved them. I loved their adventure to other worlds with their mixture of futuristic science and things that could only be magic. YA wasn't even a genre at the time but A Winkle in Time was the book that launched a lot of preteens and teens into a livelong love of the science fiction and fantasy. The main characters weren't superheroes. They were regular kids with real lives, yet they rose to the challenge and won. Madeline L'Engle was ahead of her time in this award winning book. I was grown up before I realized she'd written more than one book. Of course, I bought the entire series for my daughter. Lesson: It's okay to blur that magic/science fiction line if you write a great story. Heroes come in all shapes and sizes and from all kinds of families. One book at the right time, can turn a child into a lover of the written word. On a side note, when I was in elementary school, my poor little tiny country school didn't have its own library until I was in 6th grade. That wonderful 5th grade teacher gave me a real gift with the books she allowed me to borrow. Years later when I was around 12, I started playing on a women's softball team and this teacher was one of our players. We ended up being very close friends for many years. And wow, could she hit a ball for a country mile. I only hope a few of my students loved me as much as I loved and admired her. Here's to you, Carol Livingstone. Have you read any books that mix science fiction and fantasy? Do you remember the first book that introduced you to your favorite genre? Ever make a friend of one of your teachers? Does your school have a good library? My fav genre is fantasy and the first book that really introduced me to it (other than fairytales) was The Hobbit. Our teacher read it to us in primary school. Our primary school didn't have a great library, but my secondary school's one was pretty good - I made my way through all the sci-fi and fantasy in it :). We had to read The Hobbit in 9th grade and I fell in love then. I read the entire series at least once per year through high school. A great book and a lovely story. That so great that you were able to thank the author who inspired you to be a reader. I wonder, Susan, was it this Carol who made you consider being a teacher? People can be like books, too; read at just the right time. 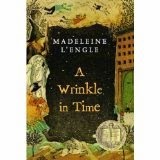 A Wrinkle in Time was my first SF book. It's also the book that inspired me to read every other book in our teeny, tiny school library. I re-read that book so many times through the years. When we finally got a library, it was pretty small. Yes, great minds thinking alike. Believe it or not, I've never read this book. No library wasn't that uncommon back in 'the day.' Or maybe I'm just a lot older than you, you young whippersnapper. That's a great book. I still remember the illustration of the shortest points between A and B. I remember the room I was in, the feel of the page, and the weather outside. It was one of those moments, because I was a kid, where I really felt my first "there are different ways to think about things!" experience. It was the first book where I kept going back and reading it again and again. It never got old. You mix a lot of things, Pat. Some that I didn't think could be mixed. We had no school library until I moved on to 9th grade. We had a traveling bookmobile though, so we could get books once a month. My parents would drive me in to town, and drop me off at the public library and bought me lots of used books to keep up with my appetite! A Wrinkle in Time was one of those wonderful books, and I read it to both my children. I think, though, that Robert Louis Stevenson's - A Child's Garden of Verses is what set me on my way to writing poetry. I adored that book. The book mobile came to our area after I was older. I never used it but always wanted to. We lived way, way out in the country. What a blast from the past this was. I envied Meg and Charles like crazy. I wanted to be Meg, that's for sure. You won't be sorry. Probably read it in one sitting. This book has been on my TBR from a long time. The book that made fall in love with the written word is the Harry Potter series. Once I read the first book, there was no looking back. I can't thank my cousin enough for gifting it to me in my early teens. Harry Potter helped my second son to fall in love with books so I appreciate that series for that if nothing else. Oh, someone else loves this book! Wonderful! I miss those warm summer days when I had hours to read and read. In middle school, I was a voracious reader and I loved our school library. There were several series I really followed and I couldn't wait to get the next one. I talked the librarian into letting me be her helper. That way, when we were adding new books, I got first crack at it, ha ha ha. The librarians name was Mrs. Buch (pronounced "Book"). Thanks! Glad you're in the A-to-Z! Cool name for a librarian. In high school I was such a frequent visitor before school started that the librarian starting putting the new books aside for me so I'd have first chance at them. Never read it, but heard about it before. Our school library was small, but fairly good; I lived in the mythology section for years. :D And the librarians were very sweet. Oh, memories. Never got too close to any of my teachers--I was kind of afraid of even the nice ones. Never read this book though it sounds like it could be up my line of interest. I'm not sure about the sci-fi fantasy blend. I think I've read some, but right now couldn't name any. I had a lot of teachers I was close to throughout high school but only the one in elementary school. Hi Susan - loved that your teacher lent you her books, then you became such great friends. Brilliant you were able to buy your daughter all of Madeline's books and no doubt read the others .. and I love the Eleanor Roosevelt quote ..
She was the most special teacher of my elementary career. All her students loved her because she made each one of us feel special. My daughter discovered L'Engle at about the same age you did, and she loved them! The Eleanor Roosevelt quote is wonderful. Thank you for sharing! My daughter did too. It's a great series for girls. It will be more special because it is yours. That sounds like the hard way to renew a book. Glad you finally got your own copy. That is an example of a GREAT teacher. I wish all teachers had a heart for their students like that. Yes, I was very close to several of my teachers. I'm very thankful for their input in my life. I think their love for me influenced me to be a better teacher. She was wonderful. I had one high school teacher who really touched me too. I never read a Wrinkle in Time (or anything else by L'Engle)--when my dad read the book to my sister I was too young for it, and it wasn't something I ever picked up later. But I've heard great things about it! Hurrah for you dad for reading to you. It is a great book. loving your lessons of writing wisdom! and who doesn't love a little sci fi mixed with fantasy once in a while! they're both magical! Sometimes it's difficult to tell the science and fantasy apart. Love your blog - thanks for stopping by mine! Really eye-catching and interesting - and I am a fan of A Wrinkle in Time! That's a good one. And it probably was one of the first science fiction books I ever read, come to think of it. I've read a few of the science-fantasy variety. Some were good. Others...not so much. I've never read that book but I've heard a lot about it. The Lion, The Witch and the Wardrobe was the book that really got me into fantasy. I loved A Wrinkle in Time with its blend of real world, sci fi and fantasy. That's one book I haven't read yet. I haven't read that book, but I have had teachers who became friends of a sort. They were usually teachers who offered that little bit of extra to get young minds thinking or who encouraged their students to read and explore things. Some teachers just have a gift of giving and inspiring. I should do a post where every one can share their story of a favorite teacher. It's not fiction-related, but I had a history teacher who would lend me texts by historians as she knew I was passionate about the subject but the books were expensive and not readily available in libraries. We used to have great discussions about them when I returned them too. There's a history teacher at our high school that turned all four of my children onto history. He's amazing. And you reached your goal because you are awesome. Thanks for stopping by. Madeline L'Engle is awesome. I first discovered her books in sixth grade. I've only read a couple of them, though. Hopefully I can get around to the others someday! I used Wrinkle in my sixth grade classroom. My favorite line was when Mrs. It? fell from a chair. She was Ok, but her dignity had been bruised. I have never read this book, but I remember falling in love with books in fourth grade. I read Island of the Blue Dolphins and I just loved it. I am not sure exactly what it was about that book, but still to this day I remember the feeling I had when I picked that book up. I love that she let you borrow her own books! Having great teachers inspired me to be a teacher. I need to read A Wrinkle in Time, as it's been eons since I last read it. I loved A Wrinkle in Time. And I had a fabulous 6th grade teacher who made a big impact. I have never been a big reader. I attribute my lack of interest to how uncomfortable my grade school teacher made me feel. I had trouble learning how to read. I think it may have something to do with bad ear infections I had when I was little. I felt self-conscience and stumbled to utter the sounds of the words. It was a horrible, horrible feeling to a wee one to have towering mean giant look down on you because you had trouble with sounding out words. I came to think, if someone who could read better than me must be smarter than me, too. So, I dumb down myself driving my self-esteem into the ground. I learned in my early teen years I had severe scare tissue on my ear drums after seeing my ears, nose, & throat doctor. I had yet another bad sinus/ear infection. My hearing isn't impaired much as an adult, but it sure isn't what it should be for my age either. The only thing to change over the years is that I am not that little nervous kid afraid of the world. I am confident and smart, but reading anything of length just isn't appealing for the most part. On the occasion that I do read anything, I like true stories. I bet your students love you, too! 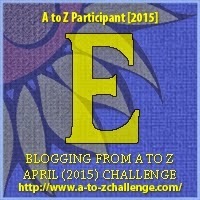 Thanks for hosting the A2Z fun! I didn't read Madeleine L'Engle's books until about ten years ago, and I just fell in love with them! This is one of my favorite books of all time. I used to reread it over and over as a child. I related so much to the character of Meg who was kind of a misfit and her interaction with IT was so powerful. Good choice! I haven't read this one... yet. I HAVE seen it around the blogosphere, mentioned by lots of bloggers/readers/writers. Yes, I love the Madeline L'Engle books, and also the Diane Duane young wizards series that mix science and magic in a similar way. Thanks for sharing this.